Game porter Ryan Gordon sure has been busy. Only recently we got Turok for Linux and now Turok 2: Seeds of Evil is in beta for Linux. Seems this one actually had quite a number of enhancements over the original release. These updates include 64bit support, a new UI system, a modern graphics system with a deferred renderer, shadow maps and compiled light maps, screen-space reflections on textures and materials and more graphical improvements. It's not just the graphics which have been beefed up, the AI was also updated to make it smarter and more menacing. The control scheme for your character was also improved, giving you better speed and manoeuvrability, including letting you grapple ledges. 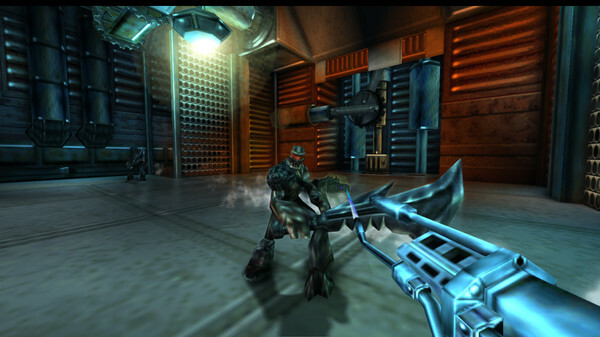 Additionally, it includes a new "Last Turok Standing" multiplayer mode. Since it's in beta, you will need to opt-in manually on Steam. There's no password, just right click it in your Steam library, go to properties, select the beta tab and then find it in the drop-down box. You can grab a copy on Humble Store or Steam. If you're a developer looking to get your game ported to Linux, why not try reaching out to Ryan. Still waiting on the Linux version of the first game to show up on GOG, I never played these games more than the first couple levels so it would be great to finally take a proper look at them. Yeah, what happened to the Linux release on GOG for the first game? Speaking of Ryan Gordon and GOG, maybe his next porting project could be GOG Galaxy. I mean if GOG can't find the resources for it internally they really should outsource it. EDIT: lol wait that can be horribly misconstrued. https://en.wikipedia.org/wiki/Give_me_liberty,_or_give_me_death! I want this so bad. I'm still hoping they both make their way to GOG soon. Kristian Speaking of Ryan Gordon and GOG, maybe his next porting project could be GOG Galaxy. I mean if GOG can't find the resources for it internally they really should outsource it. If this is released, i'll consider buying games on GOG for Linux. What a great idea! This could be a chance, i wonder if this has crossed Icculus' mind. Gotta hint him. Looking at the game files, it would appear this uses (what I though was dead) TurokEx. With regards to the comments about GOG, I personally feel we shouldn't look a gift-penguin in the mouth and appreciate that these games are available via any distribution service. We are already buying copies of commercial games without the source code, so using Steam's DRM doesn't seem that much of an issue!